The agenda for Waverley Local Committee, Friday, 17 June 2016, 10.00 am has just been published. This entry was posted in Meetings and tagged Haslemere Hall, Surrey County Council, Waverley Local Committee on June 8, 2016 by admin. The agenda for Economic Prosperity, Environment and Highways Board, Thursday, 9 June 2016, 10.30 am has been published. This entry was posted in Meetings and tagged Economic Prosperity, Environment and Highways Board, Surrey County Council on June 8, 2016 by admin. 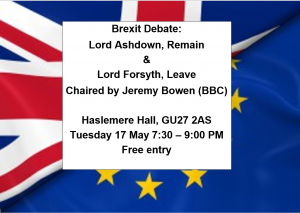 This entry was posted in Meetings and tagged Brexit Debate, Haslemere Hall on April 25, 2016 by admin. To agree the previous minutes as a true record of the meeting. · The deadline for public questions is seven days before the meeting (Wednesday 14 October 2015). · The deadline for petitions was 14 days before the meeting, and no petitions have been received. The board is asked to monitor progress on the implementation of recommendations from previous meetings and to review its forward work programme. 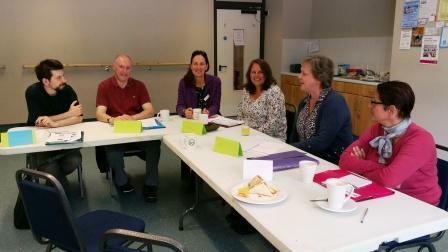 To receive a verbal update from the boards task groups and member reference groups. This report updates the Board on the review of the Agreement between Surrey County Council and Surrey Wildlife Trust (SWT) to manage the County Council’s Countryside Estate. A decision will be going to the County Council’s Cabinet in November 2015, an outline draft of which is attached. This will set out the variations to the current Agreement and the monitoring process put in place to ensure the service is delivered to the agreed standards. The Board is asked to provide feedback on the proposed changes to the Agreement. To enable scrutiny of proposals to change the service offered at the Community Recycling Centres (CRCs) to reduce costs and meet savings targets. These proposals are due to be presented to Cabinet in November. To review the summary of audit findings and Management Action Plan produced as a result of an internal audit review of the Waste Management and Minimisation 2014/15. The next meeting of the Economic Prosperity, Environment and Highways board will be held on 10 December at 10.30am in the Ashcombe Suite, County Hall, Kingston upon Thames. This entry was posted in Meetings and tagged Economic Prosperity, Environment and Highways Board, Surrey County Council on October 21, 2015 by admin. The minutes for Waverley Local Committee, Friday, 25 September 2015, 1.30 pm have been published. This entry was posted in Meetings and tagged Haslemere, SCC Waverley Local Committee, Surrey County Council on October 9, 2015 by admin. Haslemere Town Council has an Extraordinary Council Meeting this evening combined with a Finance & Audit Committee meeting. This entry was posted in Meetings and tagged Haslemere Town Council on June 8, 2015 by admin. The agenda for Environment & Transport Select Committee, Thursday, 23 April 2015, 10.30 am has been published. This entry was posted in Meetings and tagged Environment & Transport Select Committee, Surrey County Council on April 16, 2015 by admin.